It has only been possible thus far to reliably predict the water level of rivers a few days in advance. Scientists are now developing, with the aid of ocean and climate data from the last six decades, a calculation model that enables longer term predictions. "Fisherman, fisherman how deep is the water?" - "Five metres!" - "And how can we cross the river?" Not only school children, but inland waterway transport requires dependable information regarding current water levels. This is important for finding out whether a river is navigable for large, perhaps only smaller or even minimally-loaded ships with a shallow draught. And predicting the water level is similar to forecasting the weather: The earlier the information is available, the better. However, dependable water level predictions are currently made only two to eight days in advance. A new procedure is supposed to make long-term predictions possible in the future. Monica Ionita-Scholz, research scientist in the "paläoklimadynamik group" at the Alfred Wegener Institute, Helmholtz Centre for Polar and Marine Research (AWI), is developing, in cooperation with the Bundesanstalt für Gewässerkunde (BfG) statistic models for assessment of future water runoff expected over a longer time frame at various locations on the Elbe, Weser, Rhine and Danube rivers. For this purpose, she is investigating global oceanic and climatic data from more than six decades, and searching for correlations between water runoff and various factors such as the temperature of the ocean's surface in certain geographic regions, the extent of Arctic sea ice, precipitation, air temperature or soil moisture. Reliable correlations are then fed into the model as a basis for statistical calculation - and this is processed for each river individually. 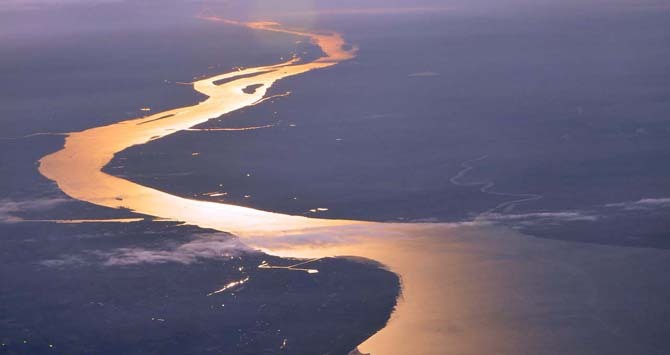 "Since each river has its own idiosyncrasies, different, or differently weighted, influential factors go into the statistical prediction model for the Rhine river when compared to, for example, the model for the Elbe", explains Ionita-Scholz. The seasons of the year also play an important role: in the same river in spring, for example, different influential factors can be decisive for the prediction when compared to autumn. "This is why we adjust the model for each season respectively", says Ionita-Scholz. "This of course does not make generation of the model any easier, but the predictions are better because of it." Application into practice is however comparatively uncomplicated; in order to be able to predict the development of a river's water level one month in advance, the Elbe for instance, the key data of the respectively required influential factors from recent months - temperature of the ocean's surface, precipitation or soil moisture - are entered into the statistic model. The model then calculates the probable water runoff for months in the near future, with which an assessment can then be made as to whether the water levels across this time frame in comparison to previous years would more likely develop to lower, similar or higher levels. "The model could also be interesting for an early-warning system for flood events", says Ionita-Scholz. "This is because the model calculations from the year 2013 ended up quite close to the actual maximum Elbe runoff that occurred at the Neu-Dachau level during the extreme flooding." In the context of the collaboration with the BfG, the model is however optimised for prediction of low to medium water levels, which are quite significant for inland waterway transport. "The results thus far from the Alfred Wegener Institute have already proven to be quite promising", opines Bastian Klein from the BfG. "Perhaps we will be able to make long-term predictions as early as the end of next year." The mariners would then be able to make plans over a longer timeline. However, when the fisherman responds to the question "How can we cross the river?" with the answer: "Just hop on one leg!" this must of course happen immediately.